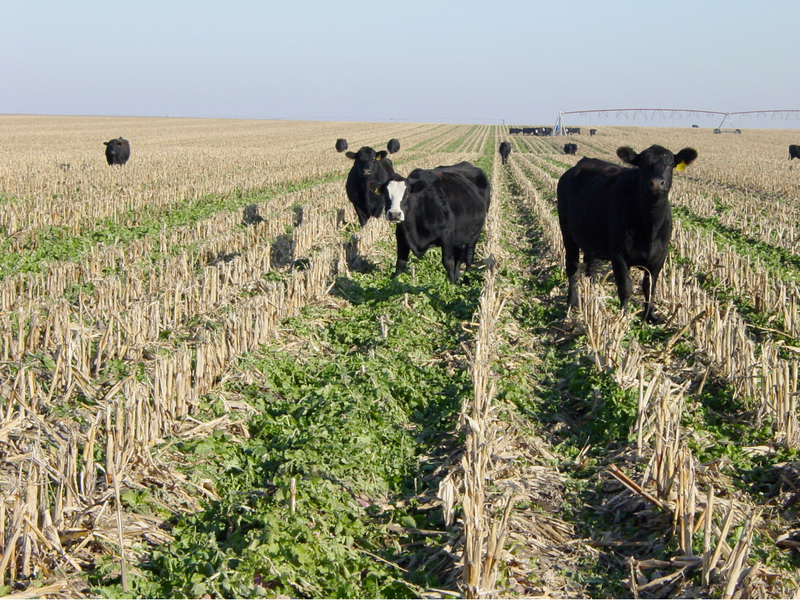 If you are considering planting a cover crop after grain harvest, consider whether the planting might also serve as fall forage for livestock. Cover crops planted after harvesting a major cash crop can serve multiple benefits. Not only can they help prevent soil erosion, provide organic matter, and scavenge nitrogen, but an additional benefit can come from using cover crops as forage for livestock grazing. Nutrient content of these forages is generally quite high, meeting or exceeding the nutritional needs of dry or lactating cows and growing calves. With good ground moisture conditions, forage production can be high enough to support a significant amount of grazing. A variety of species and mixes can be used for cover crops based on multiple goals. For example, forage turnips and radishes (brassicas) can produce a large amount of biomass for grazing and also scavenge nitrogen and help prevent soil compaction. Consider planting oats and turnips in early maturing corn silage fields for fall/winter grazing. Be sure to make a commitment to plant as early as possible. In terms of corn silage fields, this means planting in the first fields that you harvest and targeting a planting date of early to mid-August. Every day you delay is lost forage and yields will significantly drop off after the first week in September. So it may pay to hire someone to plant while you continue your silage harvest. Make sure to review your herbicide history as some herbicides have a long soil residual effect that could prevent successful establishment. Turnips are especially sensitive to some herbicides. Oats and turnip can be planted at the same time using a grain drill with a second, small seed box for turnip seed. If a small seed box isn’t available, the turnips can be broadcast ahead of oat drilling. The soil disturbance from the drill is generally enough to get the turnip started. A recommended seeding rate for oats would be 30 to 40 pounds per acre and 3 pounds per acre for turnips when planted in a mix. Seeding at these rates will result in a seed cost of around $15 to $18 per acre plus an additional $15 per acre for seeding. Even though oats and turnips will scavenge N (nitrogen), don’t forget that supplying 40 to 70 lb of N (nitrogen) will boost yields. A soil test is the best way to determine how much should be applied. The fertilizer will cost an additional $30 to $53 per acre plus an additional $10 per acre for application. Overall costs per acre would be $70 to $96 per acre. There is some risk of crop failure. However, the costs are low enough that the successful years will more than make up for years in which failure occurs. Being able to irrigate to get the stand started, if needed, will substantially reduce the risk of a crop failure. When seeding in mid-August you can probably expect 1 to 2 tons of grazeable forage. Oats in a vegetative state will range from 60 to 75% TDN (Total Digestible Nutrients) and contain 12 to 20% CP (Crude Protein). Turnips will range from 70 to 80% TDN and 14 to 22% CP. Thus oats and turnips make a great feed source for growing or lactating cattle such as fall calving cows. If we assume 70% TDN for the mix, the cost would range from $0.025 to $0.07 per lb of TDN. Oats will slowly die after several hard freezes; but often maintain some active growth into early November. Turnips will continue to grow slowly until the temperature drops below twenty degrees. Once the leaves are all grazed, cattle will pull bulbs and eat them, choking on bulbs has been an extremely rare problem. Usually 1/3 of turnip roots are utilized unless they are removed from the ground through some sort of cultivation. Even into the dead of winter, the bulb of the frozen turnip can remain grazeable but once the bulb thaws the turnip deteriorates rapidly. The biggest health risk with grazing of oats and/or turnips is bloat. As with any lush, green forage animals need to be adjusted to the new feed before grazing. One way to do this is to feed long stem hay or straw just prior to turning out and for the first few days while they are acclimating. Feeding a free choice mineral with an ionophore or Proloxalene will also reduce the risk of bloat.